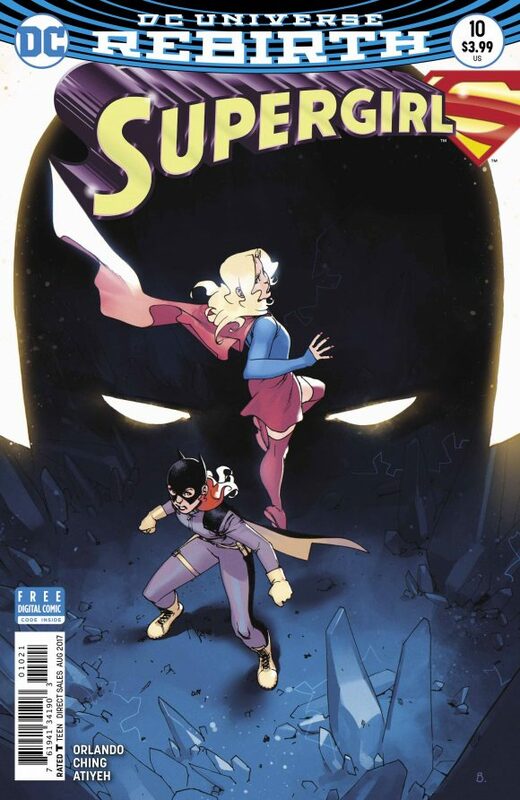 Supergirl Being Super #4 came out this week, the finale to the out of continuity Prestige Format mini-series by Mariko Tamaki, Joelle Jones, and Kelly Fitzpatrick. And I have to say I was very impressed with this ending and somewhat stunned because of the shocking, rather open-ended conclusion. If this sells well or is received well, things are certainly teed up for there to be a sequel. Let's not think about the future yet. Let's comment on the story at hand. This has always been a 'coming of age' story about Kara, learning about her past, revealing her powers, and trying to understand who she is. In this issue, she takes a major step on her journey. She recognizes her past; she understands where she came from. But she is ready to be her own person, molded by the lessons she has learned on Earth. She becomes a hero in this issue and I loved it. Yet despite learning to love who she is, in many ways she ends this story more alone than ever. But there is hope for a fuller future on the last page which is genius. Joelle Jones provides the art on the book with Kelly Fitzpatrick on colors. It is gorgeous. There are silhouettes, great angles, some stretching of perspective, and characters that feel real. Kara looks like a teenage girl. I have always loved Jones' art. I really loved it here. The September solicits for DC Comics were recently revealed and there is a lot of stuff that grabbed my attention. For me, the Supergirl, Superwoman, and Action Comics solicits are very interesting. And there are some trades being released that make me think I need to save my pennies. Okay, let's get started. First off, that is a crazy cover with a fierce Supergirl ripping apart the Emerald Eye! That is a great image! And Artgerm on the variant should be beautiful (although I will miss Bengal). And then the solicit about Supergirl trying to remain above the fray after having her life destroyed grabbed me. Steve Orlando has really made Kara a hero, helping people and being optimistic. So we'll see if personal problems make her backtrack. A couple of weeks ago, I did a rambling, off the cuff, 'typed as I thought' review of the second season of Supergirl. I definitely think I got my point across. But I am typically an organized, structured writer and that felt a bit too free form for my liking. A bit later, Supergirl Radio did their end of season recap and it was much more organized. Impressed with their categories and wanting to revisit the season one last time, I thought I would give my answers to their questions. In particular, I liked that they broke out 'best' from 'favorite'. I think those are two very separate things. And I'll try to spread things out a bit. The action of 'Alex' and the ending of 'Exodus' are so powerful that they could have swept the awards. But we saw so much more. 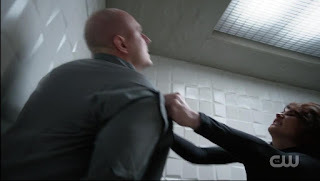 This episode showed Alex's loyalty to Jeremiah even in the face of damning evidence, here beating up a Cadmus lackey to try to find her father. We saw Kara decide to stand on her own, blogging about Cadmus rounding up aliens and getting fired by Snapper. She says the classic line 'Supergirl is what I can do; Kara is who I am.' We saw Maggie support Alex's 'off the books' mission of infiltrating Cadmus and we saw Alex take down a Cadmus site on her own. The continued threat of Lillian Luthor was on display. And we saw that Jeremiah might not be all bad but certainly isn't all good. As I said, Exodus could easily have taken home a number of these superlatives. It was the best episode. But there are more awards! 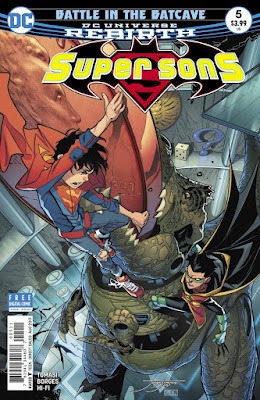 Super Sons #5 came out this week and was something of a coda for the first Kid Amazo arc as Jon and Damian deal with the punishments meted out by their caring parents. I found this to be a pretty wonderful story as the kids to terms with how similar and how different they are by looking at the relationship of their fathers. And thankfully, writer Peter Tomasi makes the Batman/Superman relationship a healthy one. Another thing which remains prominent in this book is the humor Tomasi brings to the affairs. I have usually found Damian to be insufferable. I sometimes find Jon to be a bit too much of the classic 'good kid'. Tomasi can blur the edges of both characters, making them likeable, believable, and funny. The art is by Allison Borges, a name I haven't heard of before. Borges brings a sort of cartoony feel to some of the sillier moments while grounding things a bit more once the adults show up. It works here nicely. So while there isn't a bad guy and most of the action is the two sons trying to beat each other senseless, I loved this issue. 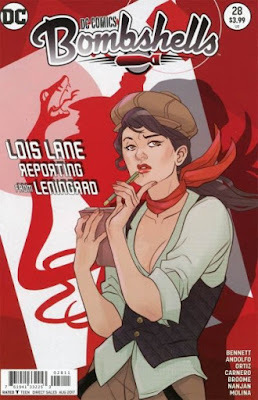 DC Comics Bombshells #29 came out last week, one of the last remaining print issue of this first run of the concept. After stumbling a bit in the middle issues, the title has found itself again these last few issues. For me, this most likely is because Wonder Woman and Supergirl have taken center stage again. And I just think that these stories of the Bombshells heading into Russia has just been more compelling than the Africa side adventure that preceded it. 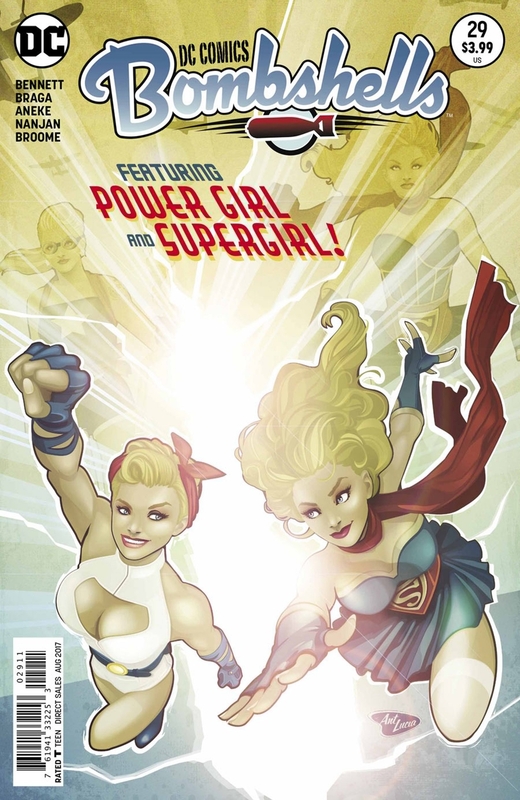 Writer Marguerite Bennett has also given us a familiar trope for Supergirl, dealing with the existence of Power Girl. And, like many before, Bennett has the two fight each other at first before realizing that they are more alike than different. Bennett also gives us a very sympathetic Supergirl, dealing with grief but still striving to do what is right. I'll focus on the Supergirl story but this issue also includes a nice opening with Raven, Ivy, and Harley. As readers we are asked the question 'what would you have done' if faced with the horrors of WWII. What are we doing now? The art is done by Laura Braga and Aneke, veterans to the book. The two styles differ a bit. One is more fine lined and detailed, the other more broad stroked and economical. The characters look great in both versions and the action flows well. 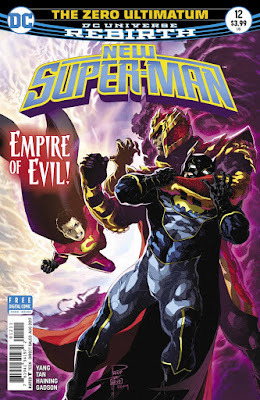 Superman #25 came out this week, the finale of the Black Dawn. This arc is truly the culmination of the first year of this book. As we have come to learn, all the mysteries of the town of Hamilton have converged into this plot. Manchester Black has been manipulating events from behind the scenes, hoping to woo Jon Kent into the fold of pro-active, amoral anti-heroes. Oh, by the way, Black's return to Earth came with him opening up an unstable gate to a dimension of monsters.With all that going on, there is plenty of super-powered action. But really this whole arc has boiled down to the concepts of hope and goodness. Can Jon shake off the darkness and embrace his father's ways? Can he realize that killing those who stand against him only makes him as big a villain? Can he get past the fact that Lois was maimed while Superman was nearby, unable to protect her? But we have to get there and this book moves along at a quick pace getting us to the ultimate conclusion and still giving us time to have special wrap-up moments for all the major players. Writers Peter Tomasi and Patrick Gleason have to bring an ending to a battle of near omnipotent gods and that is no easy task. The way Manchester Black is (spoilers) defeated seemed to come out of nowhere but when dealing with such power levels, you have to roll with it. And one of the biggest Lois moments of the year is thankfully swept under the rug in a similar way. But if you can get past how Black is defeated, the issue crackles. The art is a mix of Doug Mahnke and Patrick Gleason with inks by 6 different people! As a result, the art seems uneven. We get the crisp usual fare of Mahnke.. But we don't seem to get any of the heavy lined Gleason art I am used to. The styles on his pages change just slightly enough to jar me a bit. Superwoman #11 came out over a week ago. This review has been pushed back because DC continues to put out 4 Superman titles in the same week. As a result, this book has been pushed back a bit. Thanks for waiting! 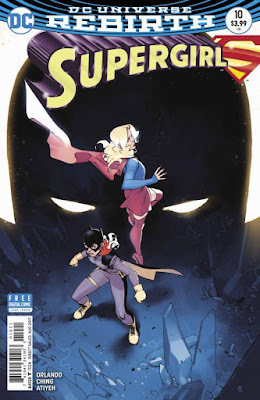 We are now 3 issues in the K. Perkins era on the title and I feel like we are finally starting to get some glimpses of what she hopes to accomplish in this run. The first issue was setting up the post-Reborn Lana. Now we are into the first arc, finding Zeke, Steel's missing nephew. This leads to a melee with Skyhook. Overall, this complicated Lana, dealing with anxiety, phobias, needing to be loved but wanting to be a hero, is a great character. I think there is a lot to be mined here. And I am hoping that the book survives long enough for Perkins to find solid footing and really explore Lana and her world. In particular, we get a hint as to how Lana's powers work in this issue which seems pretty fascinating. That doesn't mean I think we can just move forward. The post-Reborn world is confusing. I still don't know the exact nature of Lana's powers. Are they still some remnant of Superman's? And I think I need a better sense of her personal timeline to fully understand things. So I am hoping we get backstory too! The art on the issue is done by Jose Luis (no Garcia-Lopez) and is very good, reminding me of Brad Walker in some places. That's high praise. And I preferred this Renato Guedes variant cover for my collection. There is something classic about the monster looming over the hero who is tracking them. And Superwoman looks great. 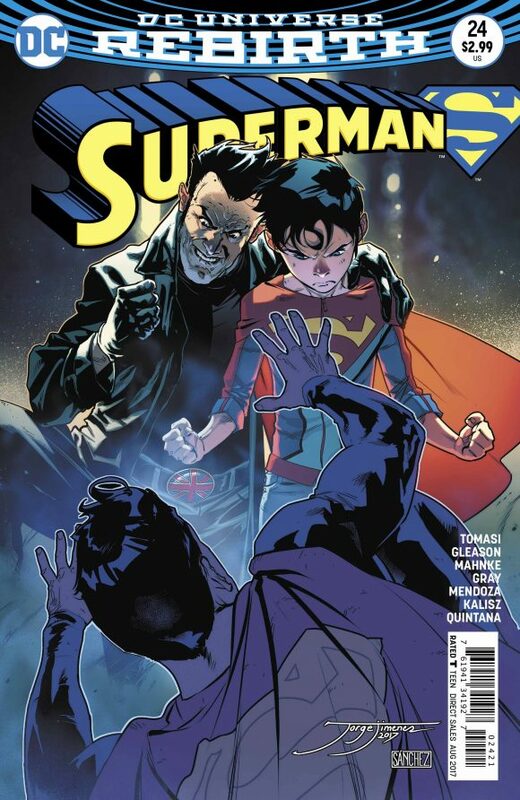 New Super-Man #12 came out one week ago and was one of the best comics I read. The book as a whole has definitely been a happy surprise of the Rebirth world, a funny, dramatic, and fresh new group of characters in the DCU. And having the sheen of classic DCU heroes has made it a little bit easier to engage. This issue really pushes the narrative forward. We learn the origin of Wonder Woman, tied to a Chinese folk tale. We learn of a running theme of the danger of individuals trying to leap from one Buddhist realm to another. We get some more of the mystery villain. And we end on a great cliffhanger, ramping up the suspense in a running subplot. I really hope that we aren't sprinting to the finish line because a cancellation is on the horizon. Honestly, this book has been a delight. Writer Gene Luen Yang walks a tightrope here. The New Super-Man is something of a conceited jerk who is slowly working towards being a selfless hero. We see enough of both sides to make Kenan feel like a real person, with faults and aspirations. There is a perfect mix of humor, drama, and action. It really is a well-rounded book with a classic feel. The art here is by Billy Tan and the best word I can come up with is lovely. There is a sort of soft elegance to the book despite it being populated by giant terrapins and snake women. It really is gorgeous. I really liked Viktor Bogdanovic's time here but I think Tan's style just fits better. Action Comics #981 is the third chapter of the Revenge storyline, an arc uniting some of Superman's deadliest foes into a lethal squad. I often find the middle chapter of an arc to slow things down a bit and this issue holds form. There is a great cliffhanger. There is a nice building momentum in some side scenes. And there is a lot of fighting. But this issue didn't feel like it had the substance of the prior chapters. It's not like this is a miss of an issue. It's not like I disliked the issue. 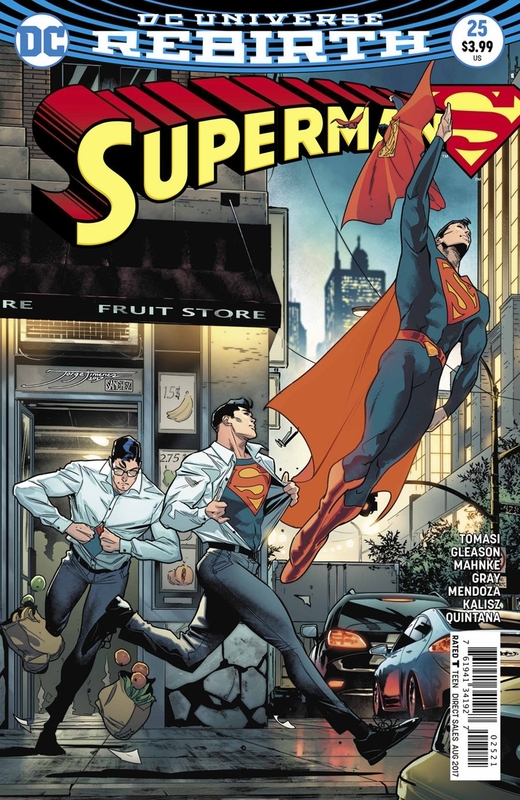 But as I have said elsewhere, I am expecting a lot of the Superman books these days. And this one didn't seem to hold up. I wonder if my overall apathy about General Zod is coloring my view. Because I do think Dan Jurgens up to this point has elevated this book substantially. Jack Herbert brings a fine lined elegance to the art here. I don't know if this style is best suited for the brawl which dominates this issue as well. Honestly, I think maybe I sound a bit too harsh here. But this was mostly big splashes of haymaker punches. I think enjoyed the smaller moments more than the melee. 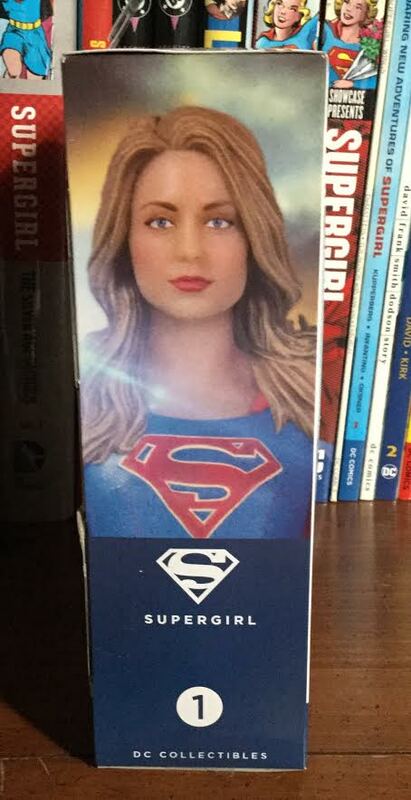 As you all know, I am a huge Supergirl fan. As most of you know, I am also a huge Legion of Super-Heroes fan. But many of you probably don't know that I am also a big fan of Looney Tunes and Bugs Bunny. I am an old guy and grew up watching reruns of Warner Brothers cartoons on the local TV station and laughed every time. 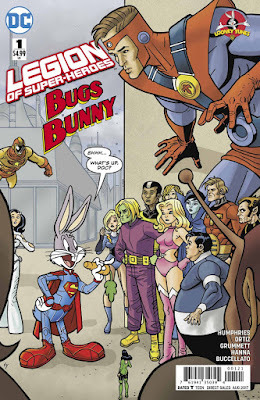 So when DC announced a Legion of Super-Heroes/Bugs Bunny crossover, I knew I was in. That's like chocolate and peanut butter. The fact that Legion of Super-Heroes/Bugs Bunny #1 heavily involves Supergirl makes it the best of three worlds. It's like chocolate, peanut butter, and a cookie crunch. And Lightning Lass, who I love, is on the role call. That's like a special layer of caramel amid the cookie, chocolate, and peanut butter. But I'll be honest, I wasn't expecting the book to be so phenomenal. I haven't laughed this hard while reading a comic in a long long time. Writer Sam Humphries brings out the best Looney Tune bits while also giving us a hysterical look at some of the most tried and true Legion tropes that are out there. If you are a fan of Bugs and/or the Legion, you simply must read this. Adding yet another layer of spectacular is the fact that Tom Grummett is on art. I know Grummett best for his time on the Superman books and I loved his Matrix Supergirl back then. His art skews just enough to the cartoony side of things to make this a perfect fit. 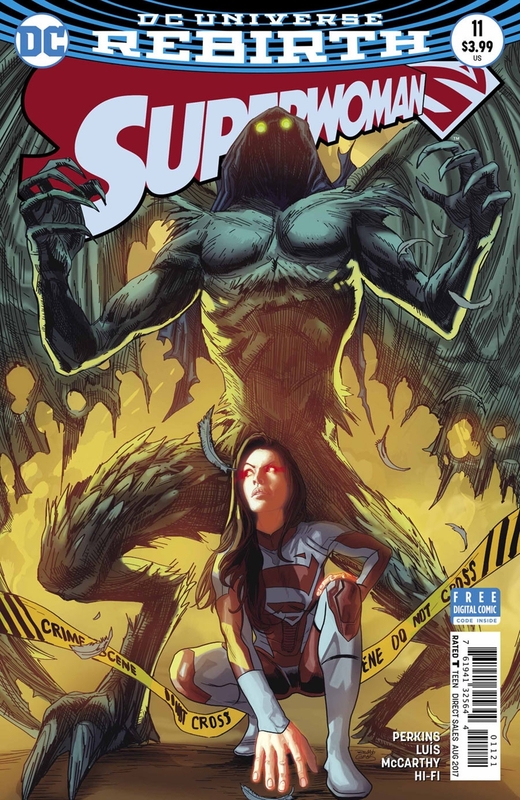 Supergirl #10 pushed forward the Batgirl team-up arc 'Escape from the Phantom Zone' plot at a fantastic speed. Writer Steve Orlando really keeps the pace of this storyline up here, having a lot of events happen in an almost Bronze Age manner. Things happened here that made me say 'I wasn't expecting that'. Surprises are always happy events for a grizzled reader like me. But I always hope that out of the blue events will be explained or expounded on later. Even with the pedal down, Orlando really keeps this a character-driven issue. We continue to see Supergirl growing as a hero, dealing with some insecurities, but standing up for what she believes in. This Kara who helps people, even those who have wronged her, is wonderful. And we start to see how she is influencing others. Small moments with Psi and Ben Rubel show this. Even her interaction with Batgirl shows how their personalities interact. And to make matters better, Orlando continues to mine the depths of Supergirl and Superman mythos. There are some wonderful callbacks to the Silver Age and Bronze Age here. This leaning on the past continuities shows a certain respect for the character and her history. That makes me very happy! The art is by Brian Ching who brings that rough feel to the proceedings, maybe most appropriate for this issue in the Phantom Zone. The covers by Robson Rocha and Bengal are great, grabbing my eye when on the shelf. 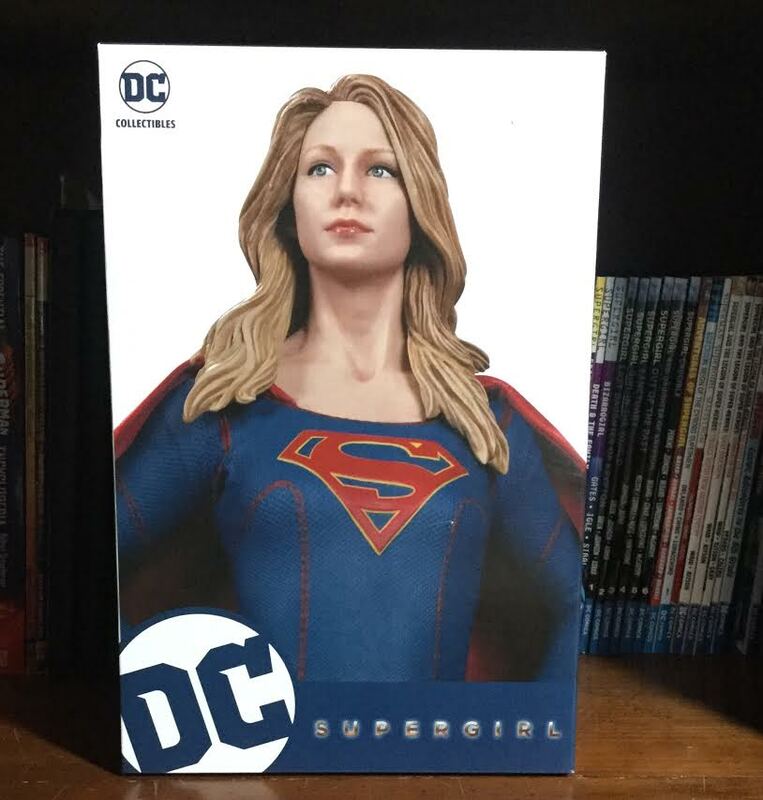 The Shriner get a big edition recently when the Supergirl statue I ordered a while back finally came in. And I literally mean big. This is a giant statue! And it is gorgeous. It actually all started with the box. This is a very clean reason patient of this statue, with an upper close lock at a very solid sculpture depicting Melissa Benoist as Kara. Last Saturday was Wonder Woman Day at local comic stores, a brilliant addition by DC to last month's Free Comic Book Day. The FCBD DC books were Wonder Woman and DC Super Hero Girls. But given the buzz of the Wonder Woman movie, I love that DC gave us another day of free stuff. And I love that they doubled down on Diana. If DC knew that they were doing a Wonder Woman day with a free Wonder Woman comic and a free DCSHG book, they could have looked elsewhere for FCBD. Instead, we get 4 Wonder Woman focused freebies. And that makes me happy! 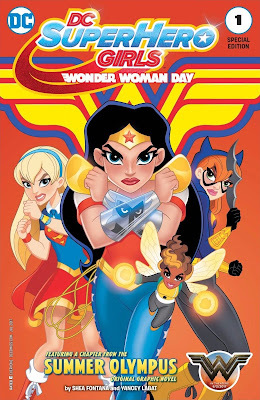 DC SuperHero Girls Wonder Woman Day #1 is just the second chapter of the upcoming Summer Olympus graphic novel which is being released around the corner. The creators are writer Shea Fontana and artist Yancey Labat, the two most linked to the Superhero Girls. I do love this cover though, something of a badass Diana with Kara and Babs ready to throw down right behind her. This is the fiercest I have seen this version of these characters. And I love Ares appearing in Diana's bracelets. And while the focus of this issue and this OGN is Diana, we get to see the other superheroes in action. So glad we got to see some hijinks on the Kent farm. The two DCSHG freebies have grabbed my attention! I'll probably buy the graphic novel when it comes out. 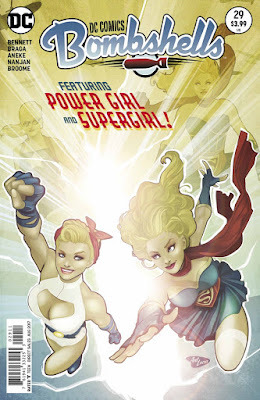 DC Bombshells #28 came out in print last week and continued a pretty engaging Supergirl portion of the Bombshell universe. We hadn't had Supergirl in the book for some time. Her arc is gripping with emotional layers and great call backs to the main DCU. I suppose one of the dangers of having a book with a cast as large as Bombshells is that sometimes characters can get lost or cast to the backburner. It can't be easy for writer Marguerite Bennett to give everyone the time they deserve in the few pages she has. I'll focus on the Supergirl chapter in a bit. The rest of this issue focuses on the other members we have been following along on their trip into Russia. 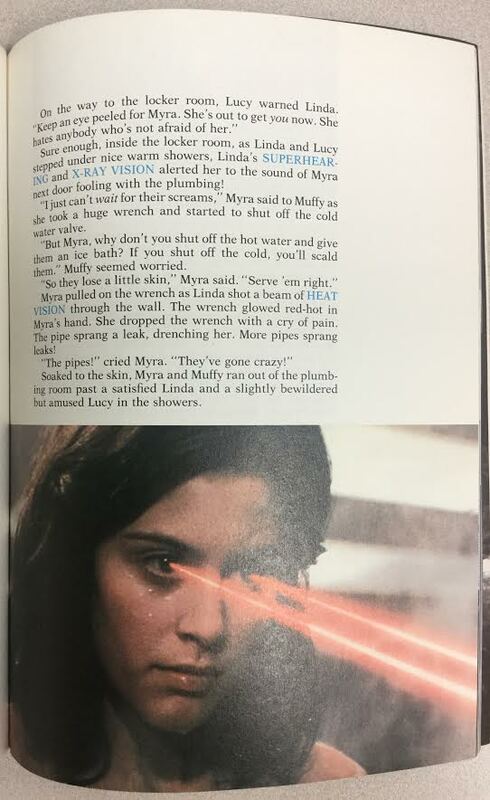 First off, Lois is chided by Killer Frost for not having killed Hugo Strange when she had the chance. The Frost turns out to be a bigger threat than had been anticipated, revealing herself as Strange's boss. not the other way around. We get a Bombshell version of the Reaper/Phantasm which was very interesting. Harley Quinn and Poison Ivy continue to work their way into Stalingrad, commandeering circus animals as new friends, and ultimately using Ivy's powers to grow crops and feed the hungry. As always, the art is stunning. From the beautiful cover by Marguerite Sauvage to the lush work of Mirka Andolfo and Richard Ortiz, the book really pops. 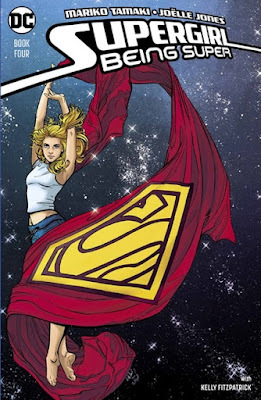 And Carmen Carnero really shines in Supergirl chapter. After several months of what I would describe as doldrums, this books is sort of picking up again. This setting, the actual war, and these characters are much more interesting to me than prior focus of Vixen, Hawkwoman, and Cheetah. Will this last rally save this book from being dropped when it gets relaunched? Superman #24 came out this week, the next chapter in the Manchester Black storyline, and I have to say this was one busy issue, filling in a lot of answers over what has been happening in the sleepy town of Hamilton all these months. Since Rebirth, I have had some concerns and questions over what has been happening around the town. Why would an alien be posing as Lois' editor? Why would giant squids be erupting from the ground? Why does farmer Cobb seem evil? Why did Jon immolate his kitten? Why??? 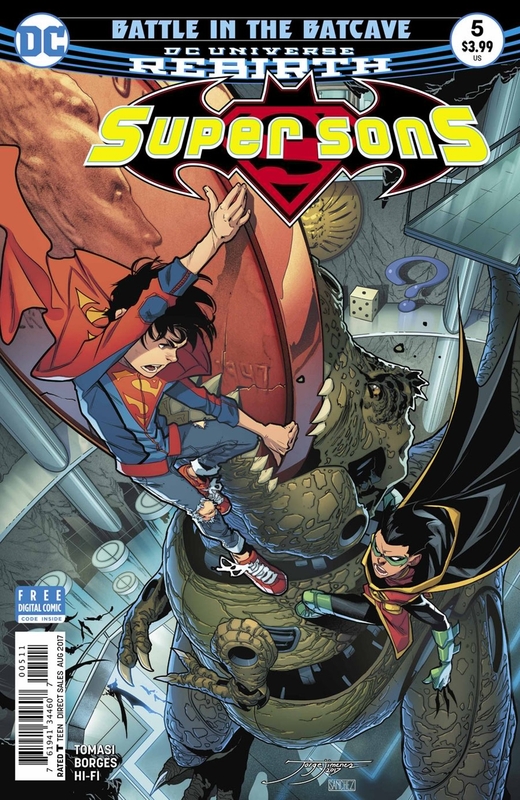 It turns out that this has been a true long play for storytellers Peter Tomasi and Patrick Gleason. Almost every question I have been asking can be answered with 'because that is what Manchester Black wanted'. And that makes me happy. I often complain about how in this day and age, books are written for the trade. How lingering subplots and strong supporting casts seem to be cast aside to tell a neat 6 issue adventure. I doubt that the layered approach that Paul Levitz brought to his Legion could survive these days. To find out that since day one, we as readers (and the Kents as characters) have been strung along by villains posing as friends is frankly ingenious. And, I'll say it again, it is also rare in this era of comics. Now the issue isn't perfect. The reasoning behind all the chaos seems to come out of left field a bit. I felt like I needed to reread the issue to make sure I understood what was happening. And maybe just a wee bit of exposition might have helped things. But overall, the very idea of having all the prior mysteries come together in this thread is pretty slick. 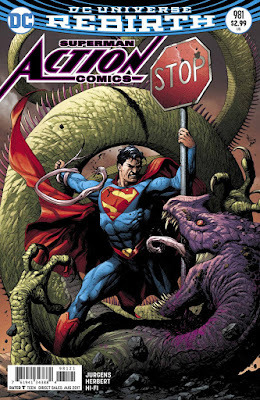 The art on the issue is mostly Doug Mahnke and he brings a sort of frenetic, over-stuffed, 'what the heck is happening' feeling to some panels which add to the chaotic feel of the story. But he also pulls back at times, giving us splashes and larger panels when the action dictates. There are some pages by Patrick Gleason as well giving us a quiet moment of strength for Lois, showcasing just how defiant she is during times of danger. Happy Wonder Woman Week here at Supergirl Comic Box Commentary! I am still basking in the afterglow of the fantastic Wonder Woman movie and thought I would take this open day to again share a meeting between Diana and Kara in the comics. 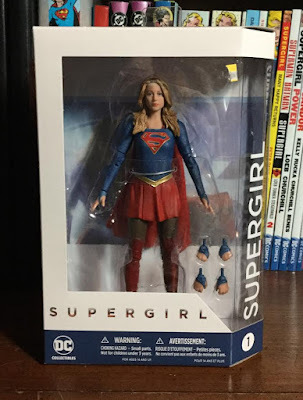 I have just covered Supergirl's day as an amazon here. But that issue didn't have Diana in it and I wanted to showcase her given the recent movie. But I am covering this issue here because of the Wonder Woman connection, so let's get on to the story! 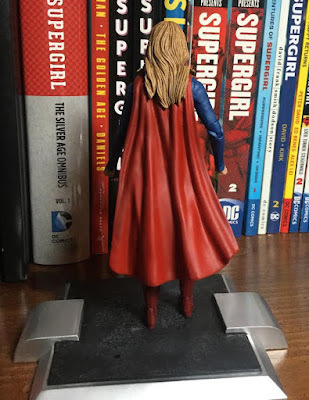 It has been a couple of weeks since the end of the second season of Supergirl and I have been mulling things over. There is a lot to think about and process when you realize we are talking about 22 episodes. I felt like I needed one more post to bring up the lingering thoughts and issues I had and give everyone more opportunity to chime in. This won't be exhaustive. This is really just me writing a bit off the cuff, talking in broad strokes, and being a bit more raw. There are definitely a lot of high points to this season and I'll go through each character after this. I think the big villains in this season were definitely a high point. Lillian Luthor/Cadmus and Rhea/Daxamites were delicious in their villainy. I thought the addition of Superman was just right. The few moments we got of Cat made me realize how much I miss her. I thought the addition of the Alex/Maggie relationship was very good. I thought the Kara/Mon-El relationship was a bit forced. But my main problem with these relationships is that it made for much fewer Kara/Alex moments, a big part of what I love in this show. There are characters that seem forgotten or lost. I thought the politics of the show often seemed heavy handed and one-sided. Much like I complained about the Feminism 101 approach to season 1, I thought this season was Liberal Politics 101. Don't tell me ... show me. It is funny to think that the episodes I feel I will rewatch the most are Mr. & Mrs. Mxyzptlk, Duet (from the Flash), the Invasion crossover, and Alex - and many of those are a bit outside of the main plot running through the show. All that said, there was never an episode that I finished and said 'that was awful'. The cast is terrific together. And there was a ton of super-heroics throughout that made me very happy. There are some things that need to be smoothed out, but overall I thought this was a very solid season. I have spoken in the past about the very giving nature of the internet comic book fan community I consider myself a part of these days. I am still shocked at the generosity of the friends I have met here. 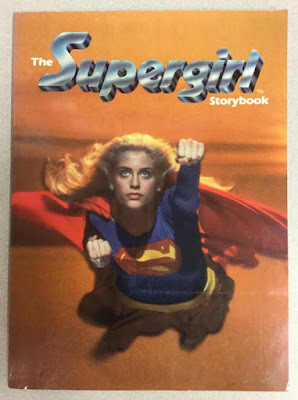 The latest example was this gorgeous copy of 'The Supergirl Storybook' sent to me by Doom Patrol and Hawkman afficianado Doug Zawisza (@DZawisca on Twitter). This is a really meaty adapatation of the movie written by Wendy Andrews. I had no idea this book even existed. And for Doug to stumble on copy that is in such pristine condition, pick it up, and send it to me is just unbelievable. First I was really struck at the condition if this book. It looks like it came off the shelves yesterday with nary a ding on the cover. And the book probably was never read because the binding is pretty stiff, cracking deliciously as I opened it wide. But second, I am really floored at Doug's generosity. This is such a wonderful gift for me. (I really can't believe how many people have sent me Supergirl stuff. I am really humbled. Here is a look at the back cover. 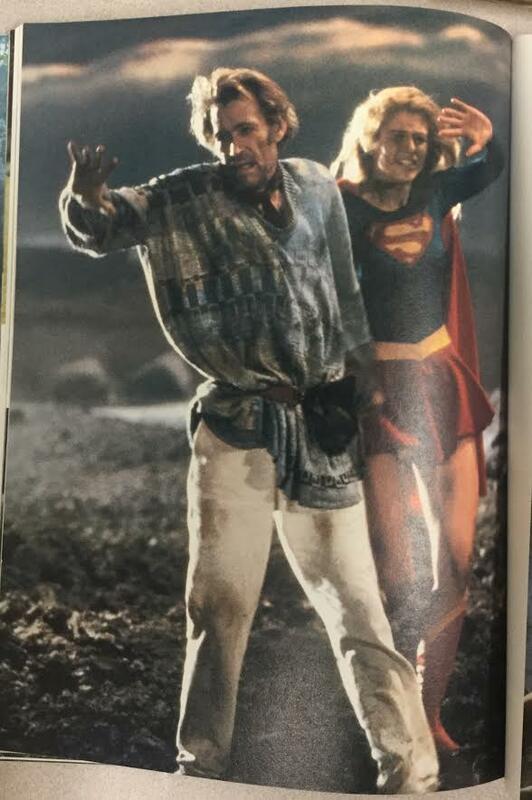 As I said this is a really in-depth adaptation of the Supergirl movie. But one of the big draws for me is the number of color photographs inside the book. As the cover says, there are over 50 photos inside, some splash pages and others inset in the text. 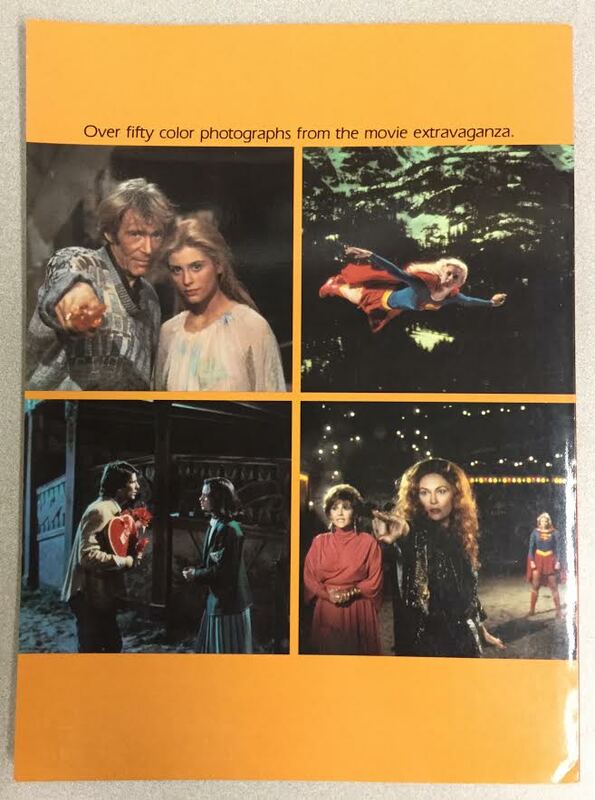 The back cover selection certainly covers the scope of the movie nicely. We see Argo City, Supergirl flying, the troubled romance with Ethan, and then the battle with Faye Dunaway. 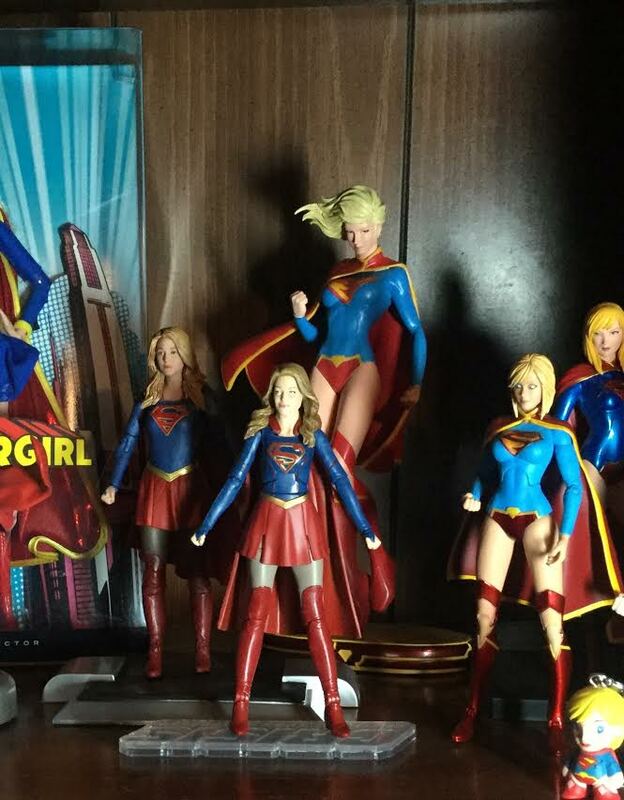 That last photo with Supergirl defiantly in the background is just great. 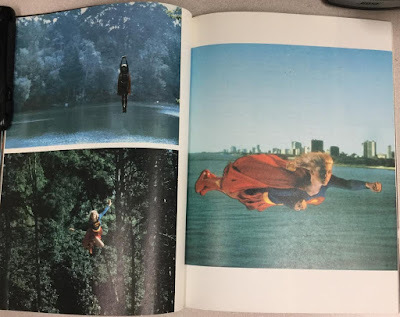 Here is my favorite 2 page spread showing the wonderfully graceful flying of Helen Slater. 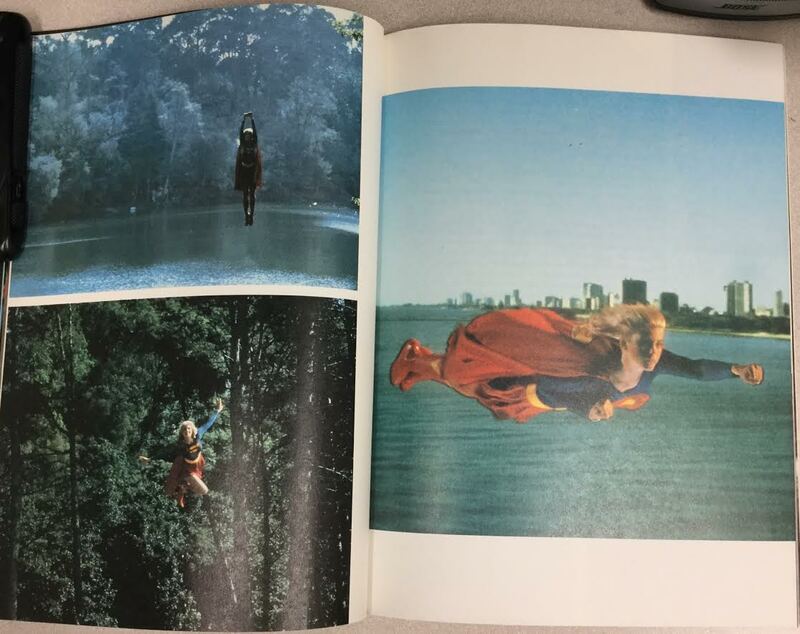 If there is a picture that embodies Supergirl in this book it is that one of her flying in the trees. She is smiling broadly, almost angelic in her body language, and just so bright! I have said it too many times but Helen Slater just nailed the part. I hope to meet her some day! As you can see, the story itself is pretty dense with a lot of description of the plot and action. This looks like it is built more for the middle school crowd. The story runs just about 40 pages with some pages being entirely text. I do like how whenever Kara uses a super-power it is in a blue bigger font. I suppose if you were skimming the story, you'd want to read the action bits. My favorite part of the movie is the battle with the invisible electricity monster so I was really hoping we would get an action shot of her and the monster. Unfortunately, all we get is her holding the lamp post she uses as a weapon. No monster. I wonder why they wouldn't include one. And, of course, I am reminded of how the cast in this movie included some pretty big names. Faye Dunaway as Selena! Mia Farrow as Alura! And, of course, Peter O'Toole as Zaltar! I know Slater has talked about how O'Toole was so helpful for her on the movie, running lines and even reading Shakespeare at times. I know the movie is a bit campy and isn't exactly the highbrow stuff these actors were used to doing. But I am glad they did more than mail it in. This book will definitely be a highlight on my bookshelf and I can't thank Doug enough. I love the Supergirl fandom that comes here. And I am awed by how giving everyone is. It is the circle of life of fandom. First off, the book sports a pretty amazing cover by Cesar Moreno. 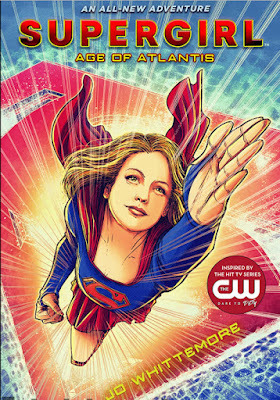 Supergirl is bursting off the cover! And I love the implied S-shield in the background. Here is the pertinent blurbs from the article (which I always recommend you read in full): The Flash and Supergirl will be saving the world some more this fall — only this time it will be in book form. 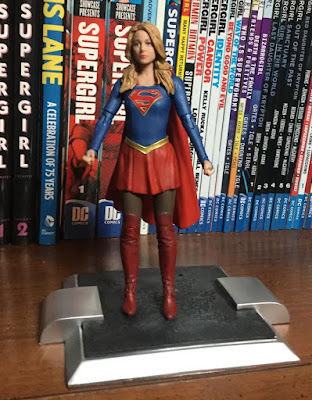 Supergirl: Age of Atlantis will be written by Jo Whittemore and will see Kara Danvers deal with various weird goings-on all over National City. 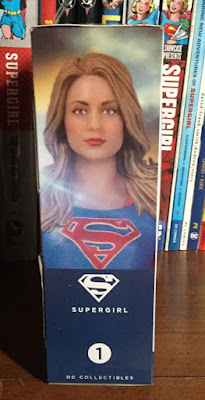 Not only have average citizens suddenly start performing feats, but the Department of Extranormal Operations (the DEO) has captured a humanoid sea creature, and Kara will have to figure out what drew him to National City, and what his connection to this surge of super-citizens may be. 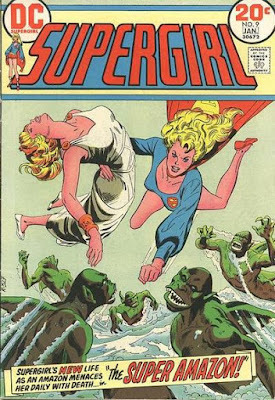 Of course, old school Supergirl fans when reading 'a humanoid sea creature' were probably all screaming 'Jerro' at the top of their lungs! What a perfect way to tie in comic history into this new continuity. 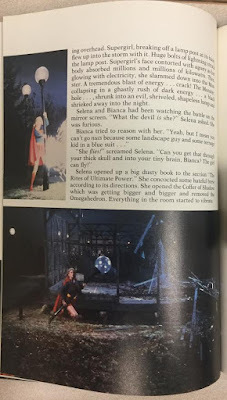 We already saw Sterling Gates do it seamlessly in Adventures of Supergirl. I don't know Jo Whittemore but certainly the plot seems fun and interesting. And glad the publisher at least came out and said they and the authors are fans. You want someone who likes the characters to be writing their stories. Yesterday my own oldest Supergirl graduated high school today. Hard to believe that 18 years have passed so quickly. Everything went by so fast. But I am unbelievably lucky to have raised such a smart, sweet, wonderful woman. Happy Wonder Woman day! It is hard to believe but today marks the opening of the Wonder Woman solo movie, the DCEU movie I have been most looking forward to. And I figured I would join in the fun of celebrating the Amazon and her universe. Surprisingly, there hasn't been a ton of Supergirl teaming up with Wonder Woman. There is the zany Haney Brave and the Bold #63 (a book I will cover at some point I'm sure), the wild massive crossover in Wonder Woman 291-293, her training with Diana in her re-introduction of Kara Zor-El to the DCU in Superman/Batman #8-13, the fight in the New 52 Supergirl #17 (booo! ), and the occasional odds and ends of meeting in panels like in Wonder Woman #600. I am sure there are more but I wish that the two would run into each other more. Today, I will look at Supergirl #9 from the 1972 Supergirl solo series. While the issue doesn't have Diana, it takes place on Paradise Island and includes Hippolyta and Nubia! 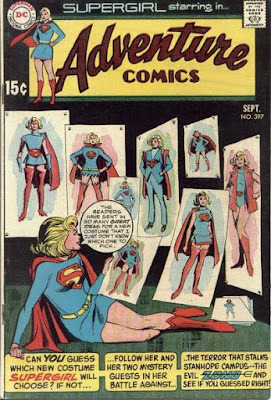 What better way to help celebrate Wonder Woman's history on a Supergirl blog! 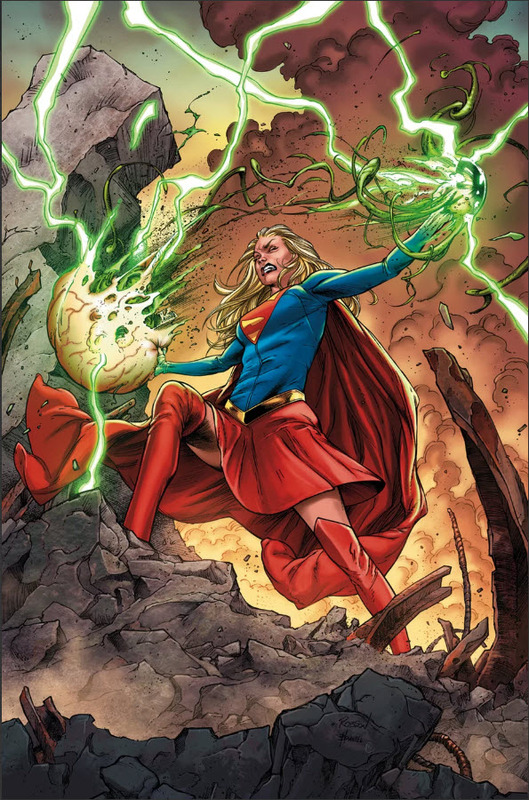 And like many stories in the Bronze Age, this won is an overstuffed, fast-moving, rather insane story and that is without counting Supergirl's swearing off men for good! So settle in for a wild ride with some great moments of 70's comic telling and Kara becomes 'The Super-Amazon'! 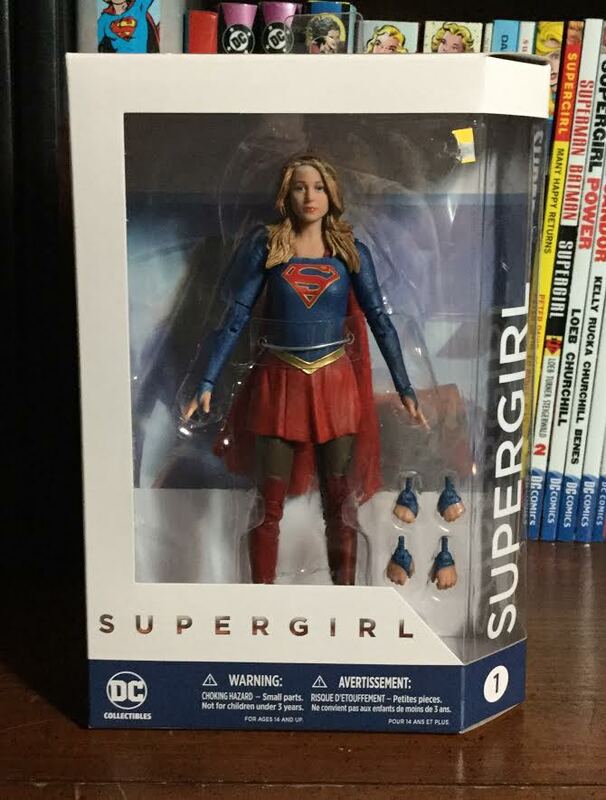 The second Supergirl action figure based on the television show comic came out last week and it is beautiful. This mirrors the show costume nicely from the big boots to the gray leggings to the thumb holes on the sleeves. There are plenty of points of articulation so that you can position the figure nicely. And the inclusion of the multiple hands are a nice touch, giving you some options. I chose the closed fist for my display. This series includes other DCTV characters including Supergirl's own Martian Manhunter! 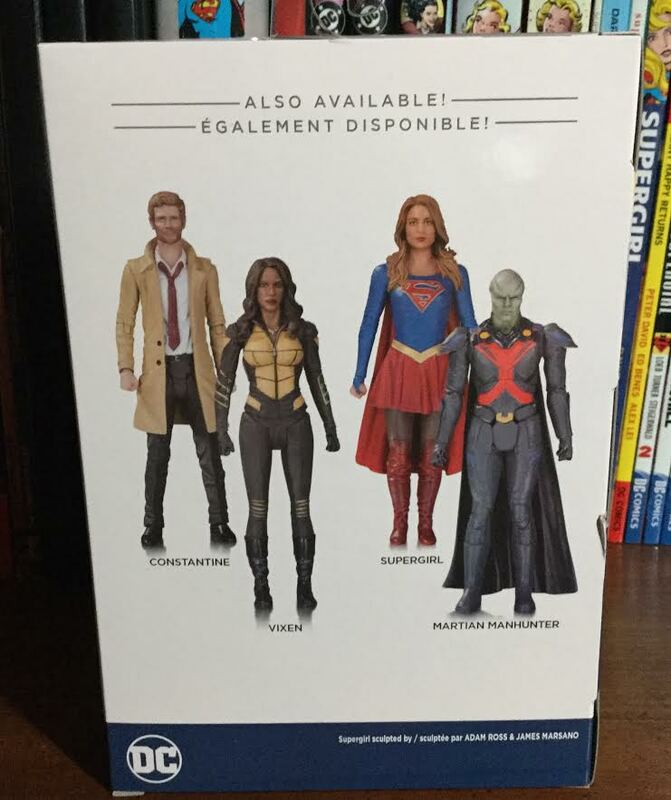 Hopefully all the J'onn fans out there are lining up to buy this. And the Vixen and Constantine figures also look great. The side of the box really showcases what I think is the best aspect of this figure and that is the sculpt of the face. It is almost eerie how much it looks like Melissa Benoist! My one complaint is the lack of a true stand for the figure. I had to dig up an old one to give the figure the support it needed to standup. But outside that, the figure is great. From the wrinkles in the boots to the skirt pleats, to that Benoist face, the whole thing is beautiful. Again, the arms have a lot of articulation so you can have her in a bunch of poses. And the back matches the front nicely. Plenty of detail work appears in the hair and cape. Obviously, there is going to be a growing bunch of collectibles based on the show costume. So I anticipate needing to rearrange things on the shrine again. But for now, I only have 2 show pieces. The two action figures are similar in design although this latest one is superior in size and sculpt. Here is a bit of a close-up, the new figure in the background there. Nice piece, albeit a bit pricey. But it is a nice addition to the collection and let's me give the show the support it deserves.